It has been a busy week. I am just back from a short but inspirational trip overseas where I spent some time with Bob and Debby Gass, before attending the Hope Celebration and then travelling to meet UCB’s global partners in Brisbane. I’ll share some encouraging news from this trip in another blog soon, but it is a great blessing to see and hear the amazing work God is doing around the world. Back at home, our family was remembering an important two year anniversary. 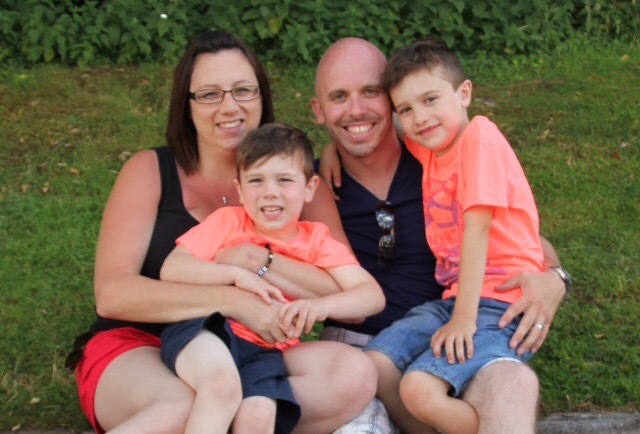 In March 2014, our son and daughter-in law were expecting their third child, when our daughter-in-law Debbie was taken very ill. To this day, the doctors cannot confirm for sure what happened, but an infection caused her body and organs to shut down. Very sadly, at eight months pregnant, Debbie lost their baby and was soon in a fight for her life as she slipped into a coma. It was a desperate time for our family and I felt personally that we were in a very intense spiritual battle and that we had to fight. The team at UCB and so many dear friends gathered around us and prayed for Debbie’s full restoration. We did not know in human terms what would happen, but we held on to God’s promises. I felt God was saying to us repeatedly, ‘I am with you…I will not leave you…this storm will pass’. His Word was a rock we were depending on, our anchor in an uncertain time. The breakthrough came about seven days later. We visited Debbie one evening when she was still in a coma, attached to machines. The following day we went to see her and she was sitting up in a chair and eating a meal. Praise God for His faithfulness and His goodness! We know that our miracle-working God was with us during this terrible trial and that even in the middle of a fierce storm, He would not leave us. Today, Debbie is fit and healthy. About 6 weeks after Debbie was very ill, I went to France to join my brother Daniel, for a crusade at his church. As a family, we had been through loss and heartache, but had still seen God’s faithfulness in the middle of the storm. Those next few weeks in France were very powerful – we saw God work in a mighty way, through many people being healed, restored and saved. God was bringing testimonies out of the many tests we had faced. Experiences like these remind me of this verse, ‘The righteous shall flourish like a palm tree.’ (Psalm 92:12 (NIV). Palm trees are designed to withstand severe tropical storms. When the storm comes, they bend with the wind and rain. It looks as though they are breaking, but they are actually just bending. When the storm passes, the area where the Palm tree has almost been torn in two, is actually stronger than it was before the storm. During this difficult time I felt God saying, “You are like a palm tree in the storms of life, but when it passes you are going to come right back up stronger and will flourish more than ever before”. As believers, the Prince of Peace lives within us. We can look at the storm and feel as though we will break. We can easily forget that He who is in us, is greater than the circumstances that we face. If you are facing your own storm or tragedy at the moment, I want to encourage you to trust in His Word. He promises to never leave or forsake us and is our Rock even in the middle of the fiercest storms. Previous postGod’s plans are so much bigger than ours. Next postWhat Easter means to me.